These artifacts are indirectly addressed to 10-14-year-old teens. The rationale of these artifacts is the conviction that when raising teens’ self-efficacy in STEM it is also necessary to provide teachers, volunteers, managers, parents… resources to create good educational contexts in which teens can develop their confidence. These videos are aimed at providing a short summary for educators who would like to know about what self-efficacy is, which strategies can be carried out to raise it, and how specifically self-efficacy can be raised in non-formal STEAM activities. 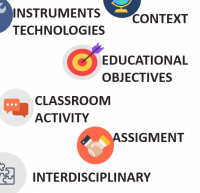 These modules are addressed to trainers of STEM teacher or educators who would like to work with their trainees about self-efficacy in STEM. By revising how an activity should be delivered, which key messages help more teens to develop their confidence, or how STEM content should be presented, training modules are aimed to indirectly target 10-14-year old teens. 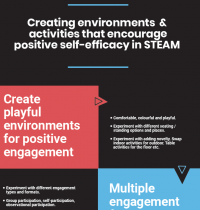 As a complement to the training modules, these graphic resources provide a summarised guidance for teachers and educators when designing and carrying out STEAM activities aimed at raising teens self-efficacy in STEM. 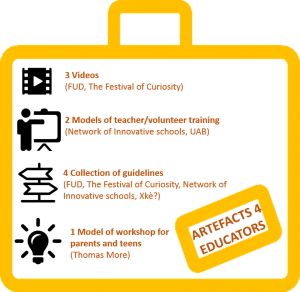 These artifacts consist on one model of activity to raise teens self-efficacy by developing family and collective self-efficacy in non-formal educational contexts.